This guide was developed as a resource for Youth Workers and a wide range of other professionals and volunteers who deliver health and well-being messages to children and young people aged 11-25. It provides health promotion information and activities on a range of topic areas. How successful is a Caerphilly Learning Pathway Centre from the perspectives of young people, teachers and youth workers? BA(Hons) Youth & Community Work (Youth Justice) Dissertation. This small scale research study involves a case study asking a question of whether a Learning Pathway Centre in Caerphilly is seen to be successful based on the perceptions of young people, teachers, and youth workers. BA (Hons) Youth & Community Work Dissertation. The purpose of this study was to identify the impact that Child Sexual Abuse can have upon young people reaching adolescence, with the intentions to understand how cognitive, emotional, social and educational development may be impaired. Nick Hudd argues that youth workers should look to the future and better embrace digital technologies in order to reflect the importance of technology in the lives of young people and their active engagement with it. ‘Youth Work in Wales: Principles and Purposes’ has been produced on a collaborative basis by representatives of the voluntary and local authority youth work sectors in Wales and with the Education Workforce Council. This document has been produced for the managers and trustees of youth organisations, politicians, local authority elected members and officers, practitioners, trainers and people training to be youth workers and youth support workers. It has also been written for young people, those already involved in youth organisations as well as those wishing to find out more about the kinds of experience youth organisations can provide. 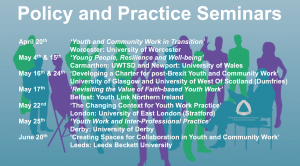 One in a series of seven UK-wide policy and practice seminars in 2018 organised by TAG, the Professional Association of Lecturers in Youth and Community Work. This seminar, held in USW Newport, focussed on the topic of resilience and well-being with inputs from Steve Smith, Jo Sims, Dusty Kennedy, Samantha Howells and Laura Tranter. This document includes the programme, pen picture of speakers and delegate list.